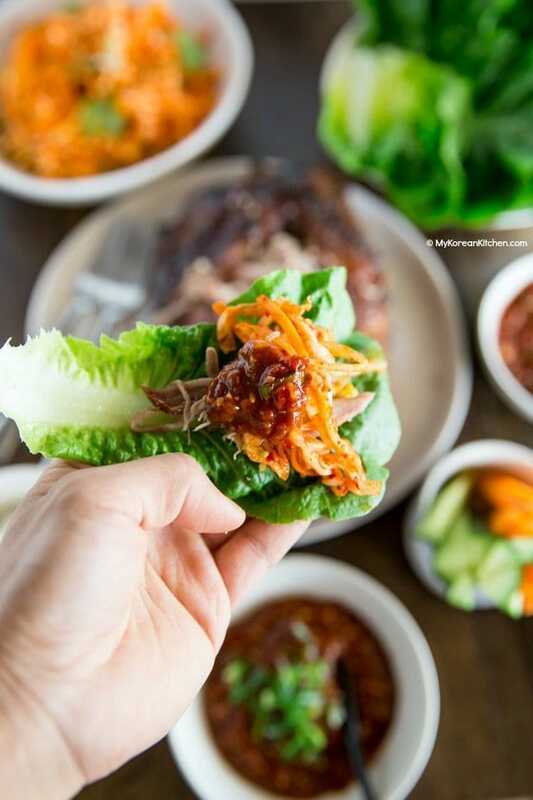 Make Korean fusion style Bo Ssam at home and fall in love with the bo ssam miracle! I finally tried the famous Momofuku bo ssam recipe at home. 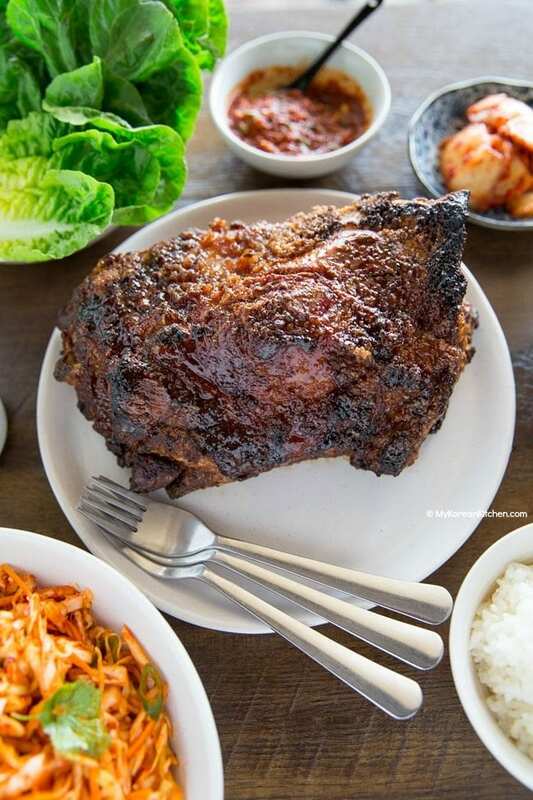 This bo ssam recipe is developed by Chef David Chang and ever since it’s been hugely popular, particularly in the United States. 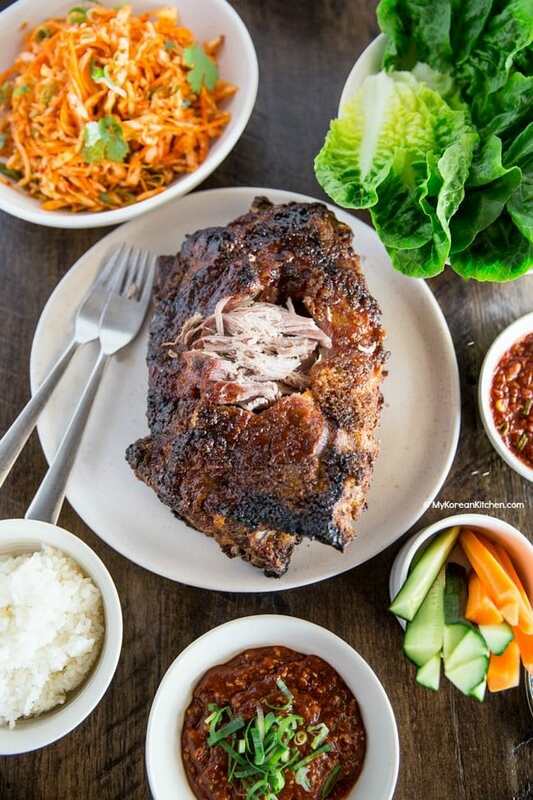 Essentially Momofuku bo ssam is slow roasted pork shoulder. Bone-in pork shoulder is dry rubbed with generous amounts of salt and sugar then cured overnight. Then it is slow roasted in the oven for about 6 hours. And then, it is finished off with another layer of dark brown sugar to caramelize the outer layer of the pork, giving it a nicely burnt sugar aroma and crunchy texture. Inevitably, inside, the roasted pork is super tender and moist. It is almost collapsible and the meat falls off the bone very easily. Traditionally, though, Bo Ssam / Bossam (보쌈) refers to a boiled pork dish with other herbs and seasonings. So in essence, there’s nothing alike between these two dishes. However, the way Bo Ssam / Bossam is served with some fresh lettuce leaves to wrap around is the same. Also, they both are accompanied with dipping sauce – aka ssam sauce and some kimchi. Making the slow roasted pork is very easy and straight forward. Assembling all the sauces and accompaniments are easy too (as long as you understand the ingredients used.) So why not use this recipe to feast your family and friends? Hope you enjoy! (optional) 2 Tbsp walnuts or your choice of nuts – this will add more nutty flavor and creamier texture. 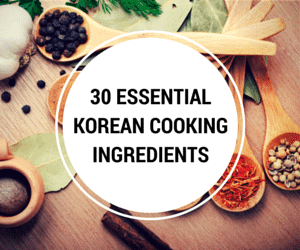 *** If you want to learn about Korean ingredients, check my Korean essential ingredients list! 1. Place the pork in a large shallow tray. (Roasting pan or lasagna baking dish works great!) Combine 1 cup of sugar and 1 cup of the salt in a bowl and mix them well. Gently rub the mixture all over the meat. Cover it with plastic wrap then refrigerate it at least 6 hours or overnight. 2. When you’re ready to cook, heat the oven to 150 C / 300 F. Cover the roasting pan with cooking foil. Wrap it around at least twice covering all the gaps. (You will thank me later! This will make your cleaning process so much easier.) 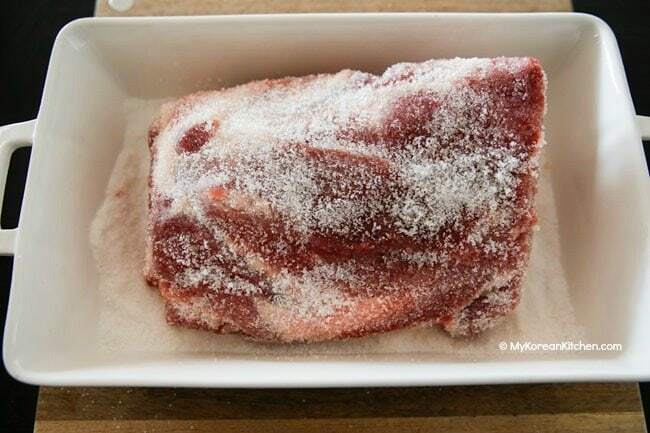 Remove the pork from the fridge and discard any juice. Leave the rub on the pork. Place the pork in a roasting pan (fatty side up if any), set in the oven and cook it for about 6 hours. (This can vary depending on the size of the pork. See note below for guidance.) Once cooked, the pork should be very easy to pull apart with tongs and forks. Remove the pork from the oven. 3. While the pork is roasting, make the salted shrimp sauce. Combine all the ingredients in a small bowl and mix. Refrigerate it until needed. 4. Make the ssam sauce. Place all ingredients, except for the green onion, in a food processor and blend until well combined. Garnish with the green onion. Refrigerate it until needed. 5. Prepare other accompaniments as needed. What’s mentioned above is my recommendation, not what’s required. 6. Combine the remaining salt, brown sugar and vinegar in a small bowl. Mix them well. Gently rub the mixture all over the cooked pork (mainly the top of the pork). Watch out for your hands as you rub as the meat can be hot. I wore a food preparation glove for this process. Turn the oven to 260 C / 500 F (or use a grill / broiler function). Place the pork in the oven and cook it until a dark caramel crust develops on the meat. It takes 5 to 10 mins. Serve hot, with the accompaniments. If you’re using a smaller meat, you will have to reduce the rub ingredients (e.g. sugar, salt etc) and also the cooking time. As a guideline it takes about 4 hours to 4.5 hours to roast 2 kg / 4.4 pounds bone-in pork shoulder. When you first pull off the pork, it’s very moist and tender, but it dries out fairly fast (like within 20 mins)! So serve immediately and eat up. It still tastes good though! I normally prepare the sauce and other accompaniments within the first hour of roasting. I find it easier as I can pay my full attention to the meat in the later hour. For an even easier ssam sauce option, you can buy this ssamjang tub instead of making it from scratch at home. While you can serve it as it is, I prefer adding small drops of sesame oil and sesame seeds to give an extra nutty flavor. 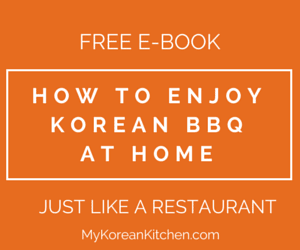 **** This roasted pork shoulder recipe is adapted from NY Times’ momofuku bo ssam recipe. Salted shrimp sauce and Ssam sauce recipes are my own. 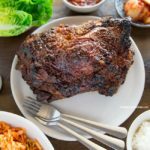 Korean fusion style bo ssam recipe. It means tender and pull apart slow roasted pork shoulder! Place the pork in a large shallow tray. (Roasting pan or lasagna baking dish works great!) Combine 1 cup of sugar and 1 cup of the salt in a bowl and mix them well. Gently rub the mixture all over the meat. Cover it with plastic wrap then refrigerate it at least 6 hours or overnight. When you’re ready to cook, heat the oven to 150 C / 300 F. Cover the roasting pan with cooking foil. Wrap it around at least twice covering all the gaps. (You will thank me later! This will make your cleaning process so much easier.) Remove the pork from the fridge and discard any juice. Leave the rub on the pork. Place the pork in a roasting pan (fatty side up if any), set in the oven and cook it for about 6 hours. (This can vary depending on the size of the pork. See note above for guidance.) Once cooked, the pork should be very easy to pull apart with tongs and forks. 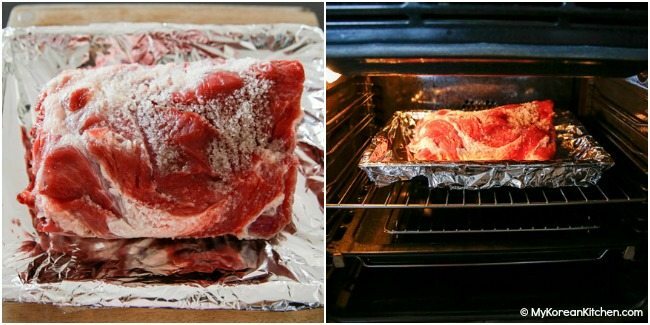 Remove the pork from the oven. While the pork is roasting, make the salted shrimp sauce. Combine all the ingredients in a small bowl and mix. Refrigerate it until needed. Make the ssam sauce. Place all ingredients, except for the green onion, in a food processor and blend until well combined. Garnish with the green onion. Refrigerate it until needed. Prepare other accompaniments as needed. What’s mentioned above is my recommendation, not what’s required. Combine the remaining salt, brown sugar and vinegar in a small bowl. Mix them well. Gently rub the mixture all over the cooked pork (mainly the top of the pork). Watch out for your hands as you rub as the meat can be hot. I wore a food preparation glove for this process. 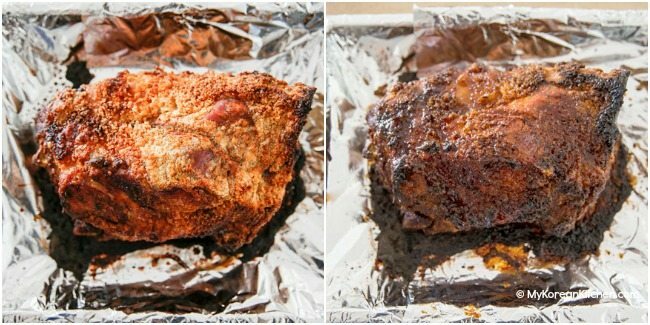 Is it okay to cook the pork inside-out? It is after summer here. Hi Godfrey, can you please tell me how you can cook the pork inside-out? I’m not sure what you mean. This looks absolutely AMAZING! Do you think I can roast a port a day before and finish up next day to serve at a brunch? I had this at a family reunion and fell in love. I am making this for the first time for a party tomorrow night. I wonder about pork sitting for an hour or two in between the the low and slow roast and final brown sugar high bake? It would make my timing easier but I don’t want to sacrifice quality. If using pork shoulder should I remove the skin first before prepping with sugar/salt mixture? Yes, remove the skin first. I didn’t mention it in the recipe as the most meat sold here is skinless already. Hi Sue, this recipe looks amazing! I can’t wait to try it. I have one question- do you think I can cook this in a slow cooker instead of oven? I live in FL so I’m afraid it’ll be too hot inside the house if I cook this in the oven for 6 hours . Thank you! I think it’s possible but I can’t give you any solid advice without further testing. I cooked this in my oven during this past Christmas holidays and it was fine. (I live in Brisbane, so I have summer Christmas. And Brisbane’s summer is notorious for being humid and hot.) And, to be honest, I didn’t notice the heat from the oven. Thanks so much for your recipe – just made it for Christmas and it was a hit. QQ, do you know why the fat side (top of pig) turned out to be so hard at the end? Is it because the fat side was too thick? Hi Sue, this pork looks amazing! I have one question; one cup of sugar mixed with one cup of salt sounds very sweet, and extremely salty. Am I supposed to use it all on the pork? Or only as needed? Thank you ahead of time for clarifying this for me. Hi Guido, For a large size pork (3.5kg to 4.5kg), I used all of the sugar/salt mixture. (You kind of need it to cover all over the meat – top to bottom and side to side) When I used a smaller size pork (2kg), I only used 1/2 cup of the sugar/salt mixture. When it came to the taste, I didn’t find that it was extremely salty and definitely not overly sweet. To us, it was more borderline of just right to slightly salty. And of course the sugar and salt are only rubbed on the outside, so it is mostly the outer parts that are crispy and salty and sugary. And we mainly ate the inside of the meat, not the outer side. Fore sure, if this concerns you, you can use less than what it requires, as everyone’s taste is different. 🙂 Hope this helps! Thanks a million for your prompt reply Sue, I will adjust the amounts of sugar and salt according to the size of my pork. Thank you so very much for all the amazing recipes you share with us. Arturo, it’s bringing the pork. Are yiu planning on cooking it? I am..my pork Burt is half the size so I am bringing it with half a cup of sugar and half a cup of salt. I will do mine in a few weeks; I need a break from meat, I’ve had too much of it lately on account of Thanksgiving. Wish I would’ve seen this earlier. My 3.5 lb shoulder was extremely salty on the outside, which I was so looking forward to after watching it caramelize. Inside was wonderful, but outer portion completely inedible. I also found the shrimp sauce extremely salty. Are you sure it’s 2 tablespoons of salty shrimp sauce and not 2 teaspoons? The Ssam sauce was excellent, though. Will definitely try this again, though. 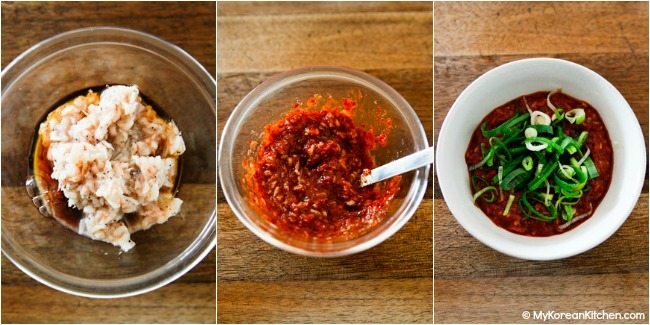 How much shrimp sauce did you use for your ssam? Of course, you can add less than 2 Tbsp of it if that’s what you prefer. But 2 Tbsp is not a typo. I hope your second attempt goes better! I’m so excited to try this! I too am going to try it at Christmas. I was several years ago engaged to a Korean Man ( which didn’t end up working out), but hace since remarried. The first Christmas I had with his Children, I fixed Bulgogi, and Spicey Pork. 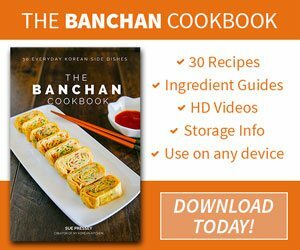 I didn’t realize how much they loved it until this year… they have requested A Korean meal! I’m looking forward to trying something new. I will report in how it was!